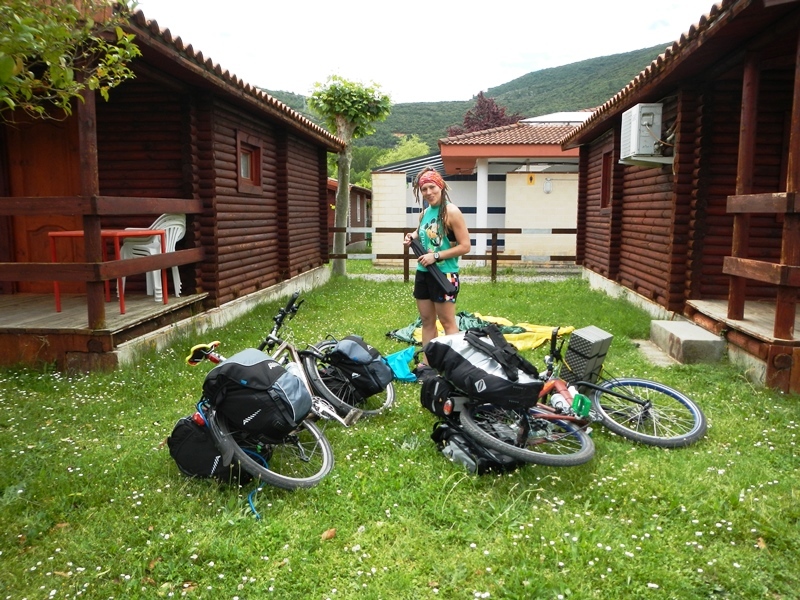 After 2 nights in a very rainy Santander we thought it best to crack on with some cycling. 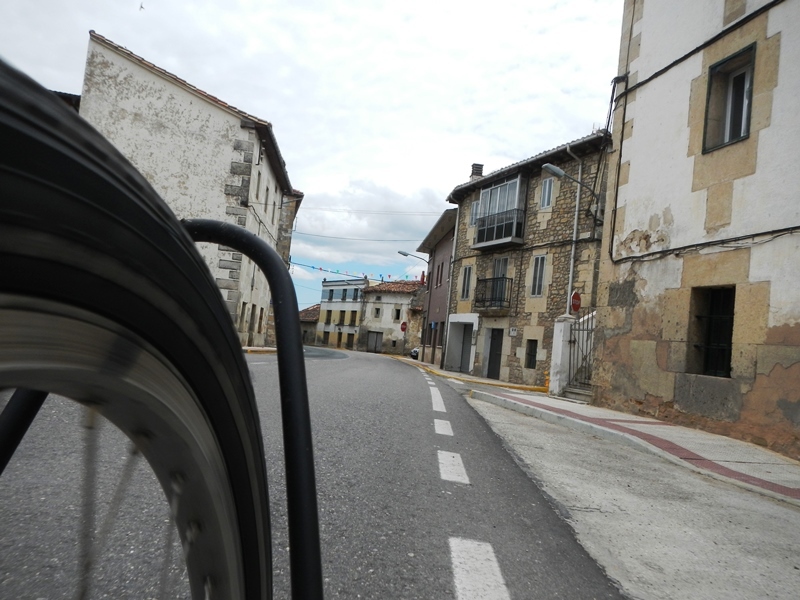 Our inital plans were to cycle from Santander to our first proper stop (Haro, the capital of La Rioja) in 2 days, doing about 50-or-so miles each day. After investigating what route to take a few days prior to departure we discovered that the 50-or-so miles also included a climb of over 4,500 ft. Ouch. 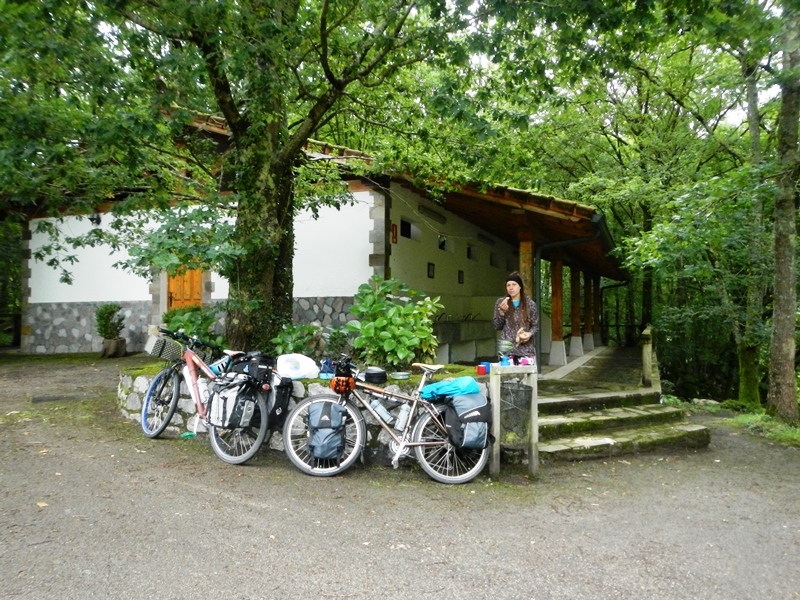 After not much deliberation we decided to head to a more easterly campsite that was a poultry 38 miles away from our current home in Santander, a sinch given that we’d both cycled much further in one go but not with fully loaded bikes. 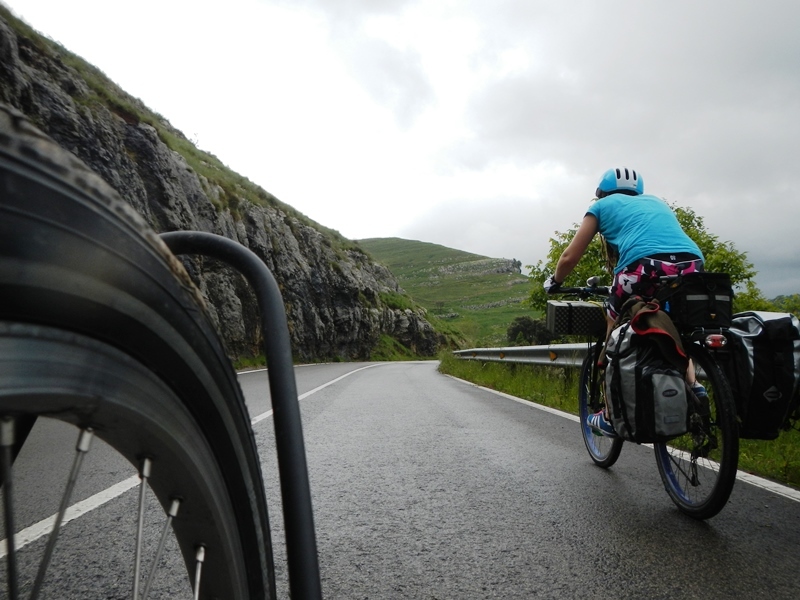 We packed up our still wet tent and set off out of Santander, wondering how easy it’d be to navigate the inevitably busy city streets. We aquired some lunch from the local Lupa (Spanish Tesco, probably) and set off on our way. 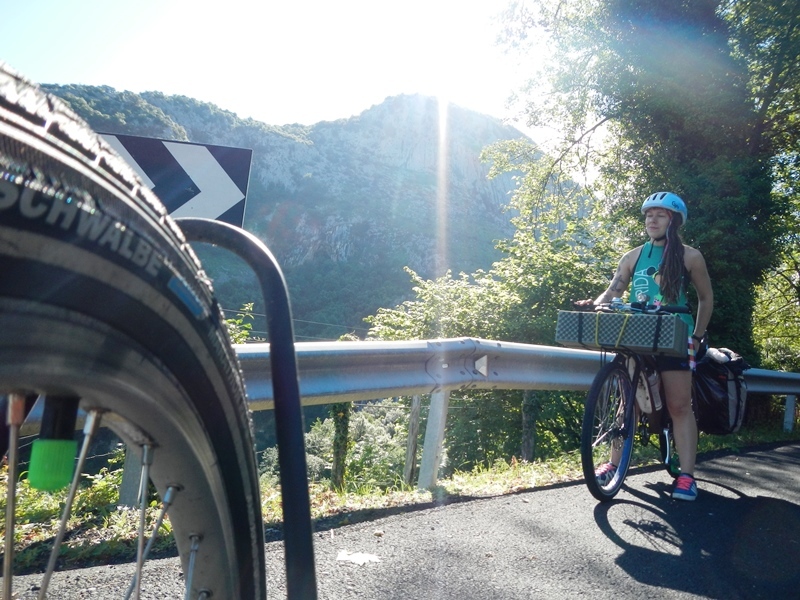 The first 20 miles or so of the day were relatively easy, apart from the fairly hairy negotiation of a number of roundabouts and a bustling dual carriageway, prompting Neola to ask “are we supposed to be cycling on these roads?”. Unsure of the answer to that, but with no plan B, we pressed on regardless, and took motivation from a passing a car with Blues Brothers-style loudspeakers on the roof (not a Chevrolet Montecarlo, but a rather less impressive Citron Piccasso) blasting out music and undecipherable Spanish chatter. In that first 20 miles, we only ascended 400 feet from sea level and were making very good time. Now I should probably point out at this juncture that in the weeks and months leading up to our trip, Neola had upped her already rather busy gym routine to 2 to 3 hours of exercise every day and, in her own words, she’s the fittest she’s ever been. I on the other hand had done next to no training and in the 3 weeks between finishing work and leaving for Spain, I had actually done no exercise whatsoever. It was at around 20 miles into our cycle that I began to regret that decision and I’ll let the next picture explain why. As you can see, for the next 7 miles we climbed. And climbed and climbed and climbed. 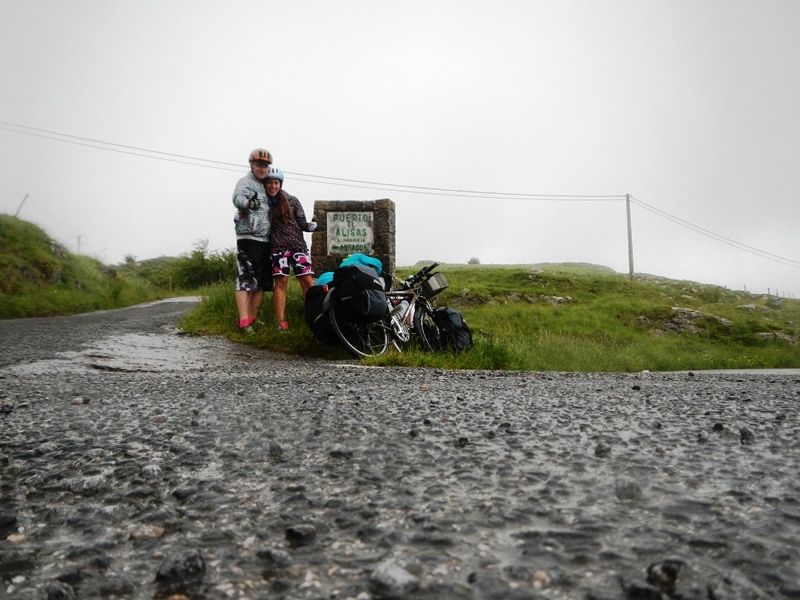 I don’t think it would have been so bad if we weren’t carrying our lives in our panniers, but we were and it was. It was slow going. 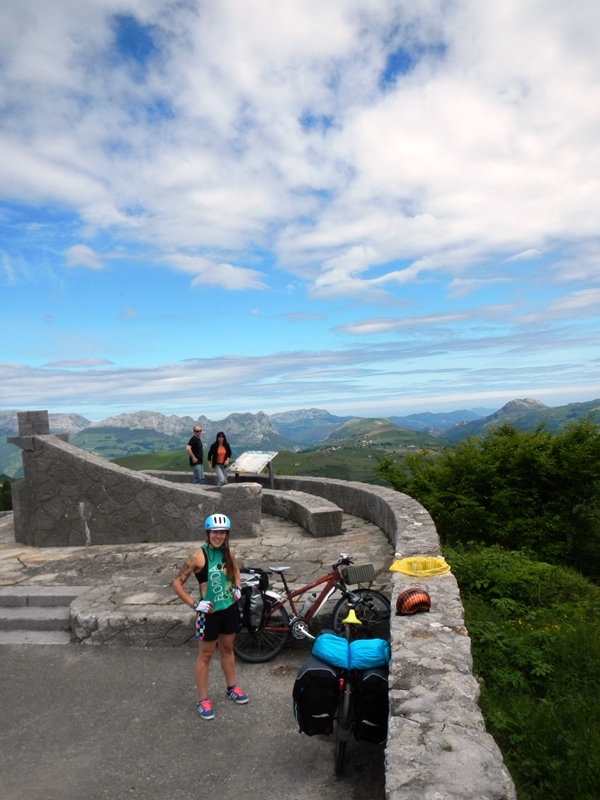 It can be slightly monotonous cycling up a constant incline but the scenery more than made up for it. Below, a shot taken from about halfway up our accent, is looking back at where we’d come from. We could see Santander port and the lighthouse that our campsite was next to. 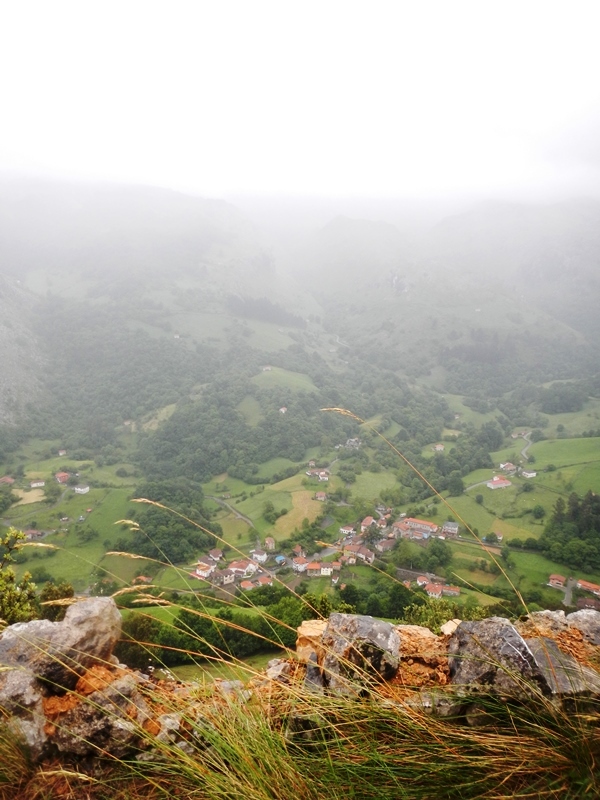 Continuing our accent of the mountain we now know as Puerto de Alisas, we started to cycle into the clouds. Somewhere between starting our journey and ascending into the clouds, we’d remarked that although it was grey and overcast it wasn’t wet, because it’d be rubbish if it was wet. Shortly after entering the clouds, it started to rain a lot. 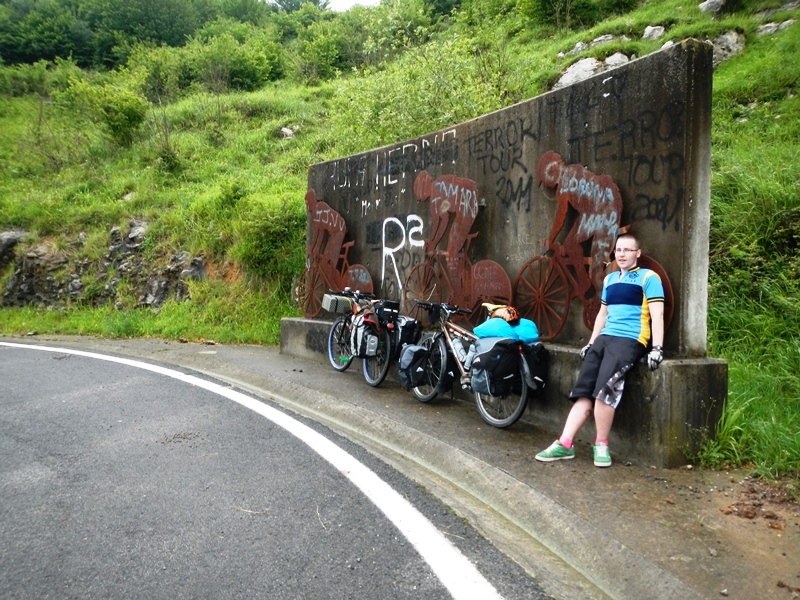 A little while later we passed a big metal sculpture of some bikes at the side of the road. After some research it turns out that this particular mountain is very popular with cyclists and (I think) it has been part of the Vuelta a Espana. 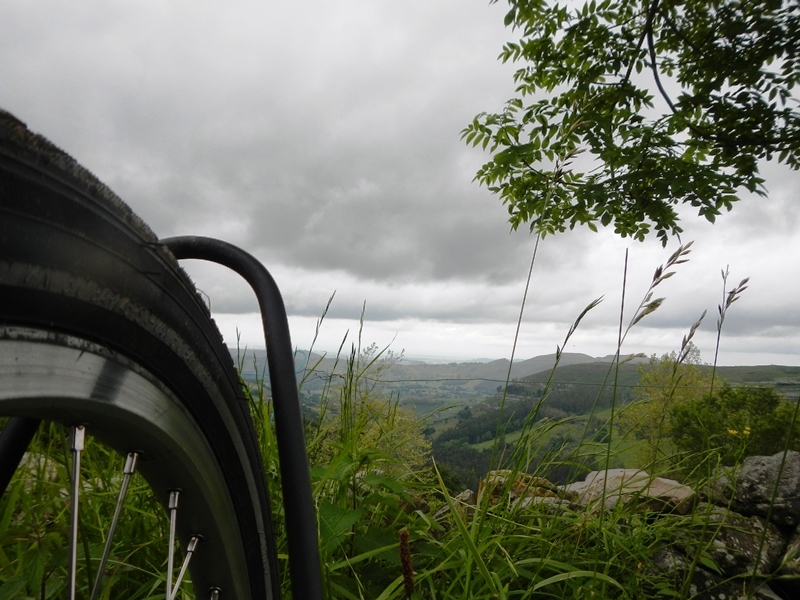 Despite the weather we kept going, that just round the next hairpin bend was the top. Eventually we did reach the summit, a climb of 674 meters (that’s 2211 ft). We took a very brief moment to celebrate in the rain and pressed on. The rest of the day flew by and at 15:30 we checked in to our stop for the night, Camping la Barguilla just outside of Ramales de la Victoria. We both changed into some less sodden clothes and sat in the bar all evening, attempting to use dial-up internet, translating the Menu to English, ordering tea then receiving something completely different to what we thought we ordered. The next day we were aiming for a campsite near the town of Frias, about another 40 miles away. In the bar the previous night we tried to find a route that wasn’t so hilly. The internet was so slow that it was tough going but eventually we found one. We’d follow the N-629 all day, it looked fairly direct and the terrain map certainly didn’t look too bad. 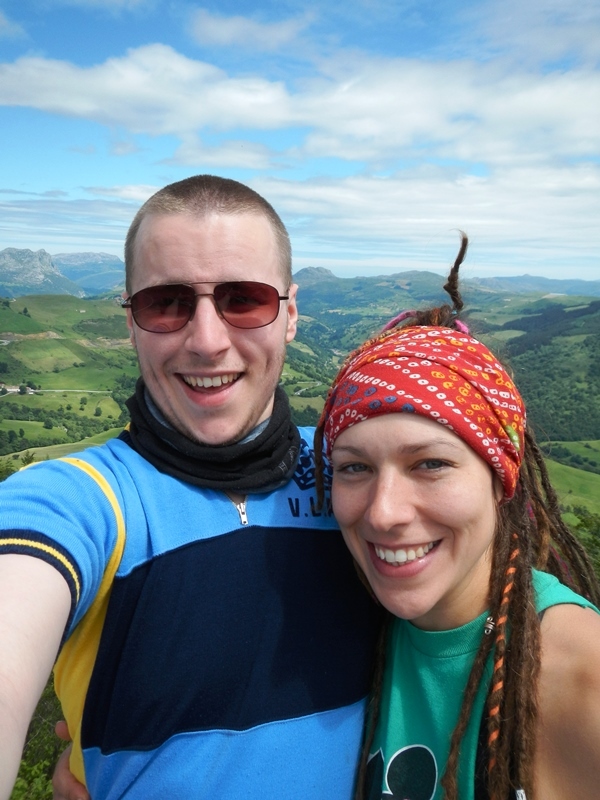 As you may have guessed from the title of this post, we did infact climb another mountain by accident. We packed up and set off from our campsite about 9am, stopped at the local Lupa (Neola passed up other supermarkets, showing some brand loyalty already) for some lunch and dinner and set off on our way. Unlike the washout Spain had been so far, today it was sunny and warm as we climbed our first hill. Again, the beauty of the Spanish hills didn’t disappoint. 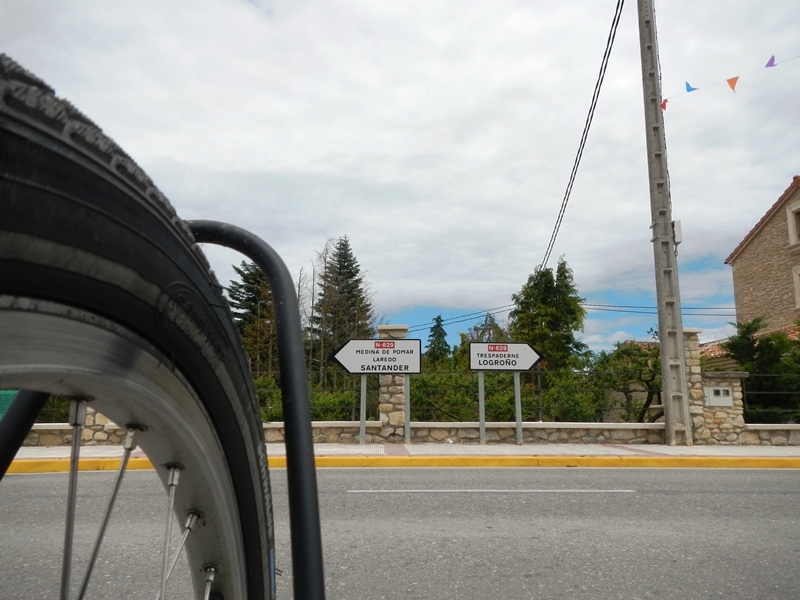 The first indication that we had started to climb a mountain by accident was not from the incline (although that did give us a clue) but it was from the passing cars and motorbikes, often beeping and giving us a thumbs up as we pedaled on. The next big clue, after already having climbed a fair way was a big yellow sign that said something along the lines of “STEEP INCLINE 10% NEXT 7KM”. For the next hour or so in 30 degree heat we kept pedaling, only interrupted by the odd beep and cheer, the odd water stop and the dangalang of the bells adorning the cows by the road. 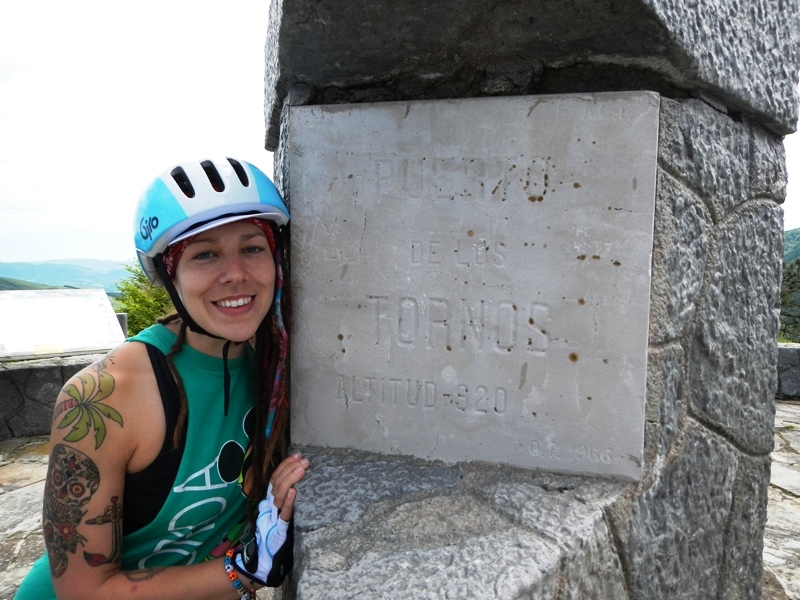 With the promise of lunch at the top, we reached the summit of mountain 2, Puerto de los Tornos, with a clap and cheer from a Spanish couple taking in the view at the top. Triumphant, we ate our bread, meat and curiously dippy camembert cheese. As you may have seen from the plaque at the top, this mountain is even bigger than the one from the previous day at 920 meters (3018 feet). 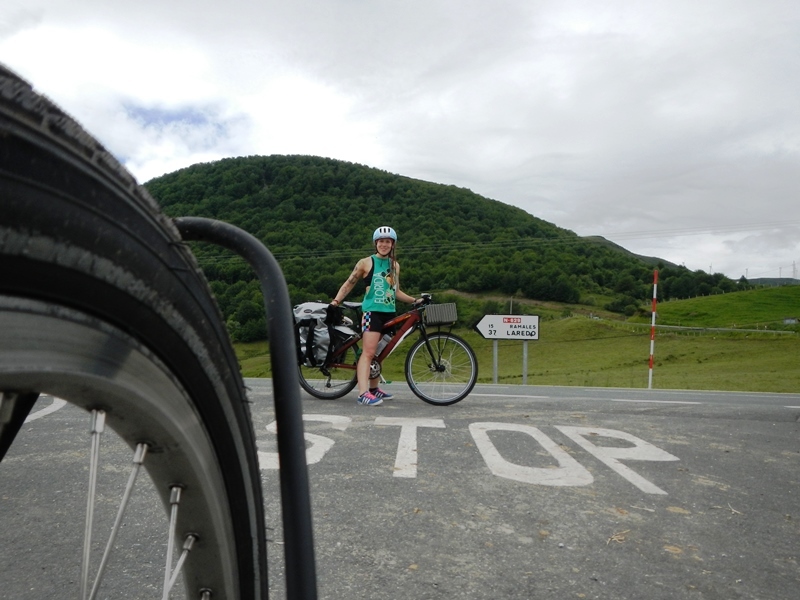 The rest of the day was fairly easy, with lots of downhill and flat cycling through tiny villages where we could make up time. 40 miles down we reached our campsite for the evening, ‘Camping Rio Nela’, or ‘Campsite Rio Neola’, as Neo insists on calling it. Neo cooked tea whilst I made more of an effort to find a flatter route to our destination for tomorrow, Haro. Loving the blogs, really interesting. Keep them coming. Hope you’re having a good time. Auntie Sandra spotted a dolphin in the sky in your photo at the top of the mountain – have a look. I love reading your blog. Hi you two, really enjoying the blogs.Keep them coming. Just had a top weekend up in Nidderdale which involved much mirth and numerous flagons of ale. Neola I love how you keep your helmet on for pics even when not on your bike haha!! You’re doing Ace guys, views look stunning. You’re gonna have thighs of steel!!! Are your bums aching yet?? ?